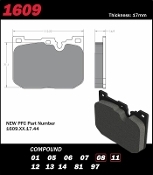 PFC Pads Now Available for ALL New BMW M Sport Applications Including the M2, M3 and M4! NEW M Sport Factory Calipers are Now Available on Over 100 New BMW Models! Both pad shapes are available in 08 & 11 Compounds. A new generation sprint and medium distance friction - the ultimate in control, with superior disc conditioning. Developed from 01 compound with improved bite, modulation, and release characteristics. It is ultra smooth and developed to reduce wheel locking at the end of a stop while giving more cold and hot bite than the endurance oriented 08 compound. Brake with confidence-brake with ultimate control and modulation. One of PFC's most popular compounds which came to fame in Endurance Sportscar and GT racing due to its performance in applications where smooth initial bite is a must. 08 has a slight friction rise with temperature, excellent release and modulation characteristics. Despite its considerable performance, 08 has the lowest wear rate of all PFC compounds and can easily match the wear characteristics of the other competitor's materials but with much higher bite and consistent performance across a broad temperature range.